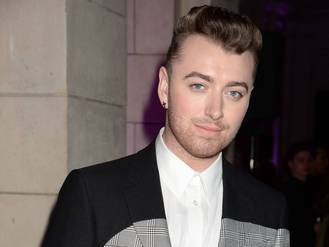 Sam Smith has confirmed he will be singing the theme tune for upcoming James Bond movie Spectre. The "Like I Can" singer tweeted a black and white photo of himself wearing a ring with a mysterious octopus engraved onto it. Said octopus is the logo for the sinister Special Executive for Counter-intelligence, Terrorism, Revenge and Extortion that features in Ian Fleming's novels about secret agent 007. The emblem appears on rings worn by many Spectre agents. Abz Love from boy band Five is selling his 2000 Brit Award on eBay to fund the purchase of some new gardening equipment. Fifth Harmony can’t wait for the magic to happen on their next record. Leona Lewis thinks Simon Cowell is great, despite leaving his record label. Paloma Faith has had to apologise to fans after greeting the crowd at a music festival in Gibraltar with “Hola Espana”. Ice Cube would vote for Kanye West as President. 50 Cent is moving to Africa. Singer Justin Bieber can wipe those tears away. His new single What Do You Mean? has smashed previous Spotify streaming records. Janet Jackson has revealed the title track and tracklist for her comeback record, Unbreakable, out October 2. Black Sabbath have announced they will embark on their last ever tour next year after five decades together.